A type of export ware catering to Japanese taste was 'ko-sometsuke' (old blue-and-white) which is distinguished by its casual decoration, eccentric shapes and defective edges where the glaze has broken away (an effect prized by the Japanese, who term it 'mushikui', 'insect eaten'). 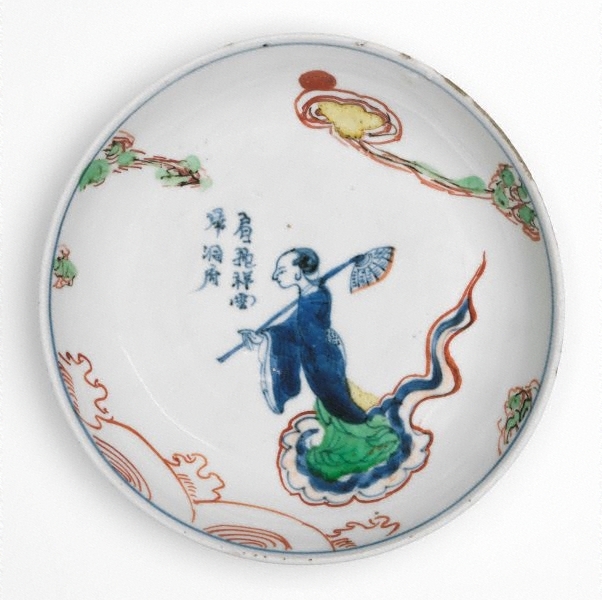 The small dish depicts the Daoist Immortal He Xiangu who, according to popular legend, was a fairy whose diet of powdered mother-of-pearl and moonbeams gave her immortality. The seven-character poem has been translated as 'Born upon an auspicious cloud, she returns to the fairy grotto'. The Asian Collections, AGNSW, 2003, pg.137.